Proton by NX audio brings you a very cost effective all in one 2 way 12” Powered amplispeaker with great capabilities which includes facilities like Built in USB, Bluetooth & SD card with Digital Display. You also have a built in FM radio and the USB module has recording capability as well. 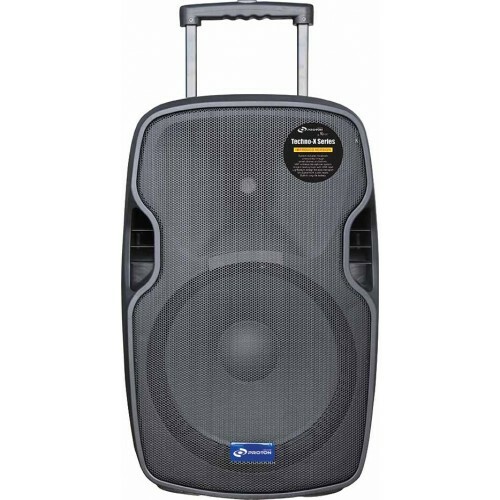 60 watts input power , 2 way, 12" Powered speakers Digital Display. Proton by NX audio brings you a very cost effective all in one 2 way 12” Powered amplispeaker with great capabilities which includes facilities like Built in USB, Bluetooth & SD card with Digital Display. You also have a built in FM radio and the USB module has recording capability as well. 1 VHF Microphone with a range of over 50 feet is included in the package. Heavy duty rechargeable battery unit is incorporated in the unit and a LED indicates the battery charging status. The Echo and 5 band graphic equalizer function enhances your voice and adds color to your program. 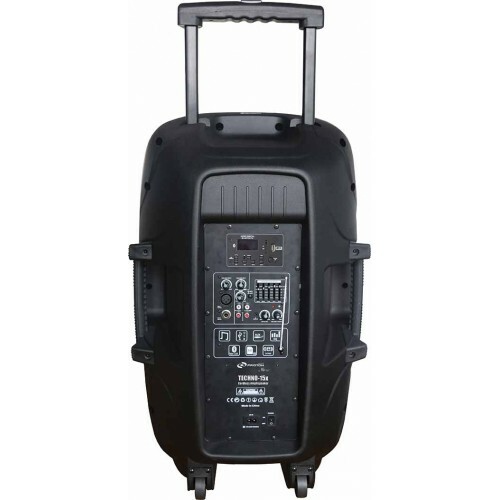 The priority function usually only in DJ Mixers is also available when you want to speak when music is being played. To control the overall functions Master volume control is provided. 3 inputs can work simultaneously. The retractable trolley makes it very easy to carry around. The unit can be pole mounted as well. This on the go all-in-one wireless unit is offered at a truly cost effective price and is absolute value for money and is a must buy. Proton by NX Audio brings you a very cost effective, all in one 2 way 8” Powered amplispeaker with g..